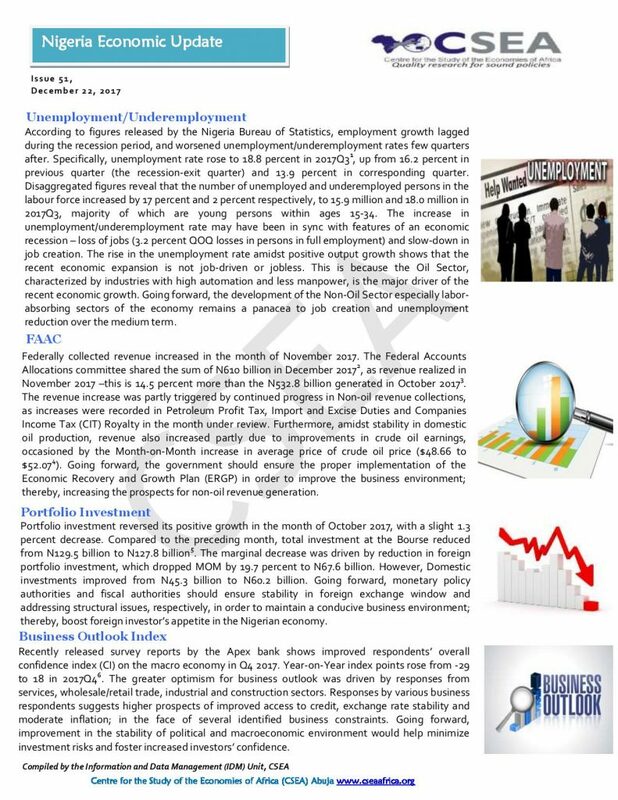 According to figures released by the Nigeria Bureau of Statistics, employment growth lagged during the recession period, and worsened unemployment/underemployment rates few quarters after. Specifically, unemployment rate rose to 18.8 percent in 2017Q31, up from 16.2 percent in previous quarter (the recession-exit quarter) and 13.9 percent in corresponding quarter. Disaggregated figures reveal that the number of unemployed and underemployed persons in the labour force increased by 17 percent and 2 percent respectively, to 15.9 million and 18.0 million in 2017Q3, majority of which are young persons within ages 15-34. Provisional Monetary statistics by the CBN show an increase in currency in circulation a portion of overall money supply. Specifically, currency in circulation rose (Month-on-Month) by 14.2 percent to N2.2 million in December 2016 the highest Month-on-Month increase recorded for the year 2016. The rise in currency- outside-bank may be attributed to the growing demand for cash balances for spending activities during the festive period. This development would largely compound the liquidity problem associated with TSA implementation and ongoing CBN monetary tightening as deposit money banks might be cash-strapped. Going forward, efforts should be geared towards intensifying initiatives that promote a cashless economy that encourages cashless transactions.